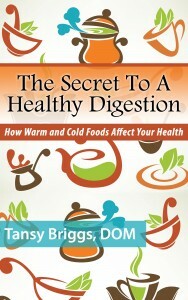 The Secret To A Healthy Digestion is written as an easy to read, non-technical guide that began as a compilation of nutrition guides written over 14 years of clinical practice by Integrative Acupuncture and Oriental Medicine Practitioner, Tansy Briggs to help her patients, family and friends. Now it can help anyone navigate any health issue, diet, trend or fad using the principles of Oriental Medicine and other key nutritional nuggets for real health. In Chinese Medicine, warm digestion is the key to digestive health. All foods have energetic temperatures on the scale from cold to hot. Knowing that subtle changes in temperature could have ripple effects in your digestion, health, and life may change your entire approach to nutrition. This book will give you a foundational perspective on time-tested Oriental Medicine nutrition modified to include and enhance modern nutritional approaches and practical advice on how to eat in a way that keeps your digestion warm, your body healthy, and reduce your stress around food decisions. This little book is for the expectant parent, the new parent or a parent of an infant who is being breastfed or formula fed facing the daunting task of transitioning your baby to eating solid foods. This is for the baby struggling with digestive issues such as: colic, reflux, spitting up, constipation or loose stools. This is for the baby with lingering chronic health issues such as: respiratory illnesses, constant phlegm and ear infections. –Dr. Claudia Welch, author of Balance Your Hormones, Balance Your Life: Achieving Optimal Health and Wellness through Ayurveda, Chinese Medicine, and Western Science.